And so it has come to be that it takes two very fine women to deliver Warner Bros and DC from their critical nightmare. From Man of Steel to Batman v Superman: Dawn of Justice and Suicide Squad, Warner Bros’ track record in putting out compelling DC superhero stories against a tirade of Marvel/Disney class acts, has been, to be put mildly, pretty abysmal. So when Patty Jenkins (of Monster fame) took up the directing mantle for Wonder Woman, one of the first women to direct a superhero movie (the only other woman being Lexi Alexander for 2008’s Punisher: War Zone), she was already shattering several glass ceilings set up by a belligerent boys’ club who still insist cape-and-cowl movies are too sacred a space for the ladies to be at. Hopefully, things will never be the same again, thanks to Jenkins and her leading lady Gal Gadot. Wonder Woman is easily Warner Bros’ best DC output since Christopher Nolan took a turn with the Dark Knight trilogy, and while it still doesn’t compare to those movies (or at least the first two of the trilogy), it comes deliciously close. A philosophical take on war and the power of love, Jenkins’ slick and dazzling Wonder Woman takes its superhero seriously and gives her an earnest and compelling narrative, one that will stand testament to her evolution over the last eight decades. The movie begins where Batman v Superman ended: Wonder Woman/Diana Prince is still at odds about returning to “help humanity” and has now set up residence at the Louvre where she studies ancient weapons. A “gift” from Bruce Wayne takes her into flashback mode, effectively beginning her origin story: from the protected life she spent at Themyscira, land of fierce, Amazonian women, to her journey to 20th-century Europe, entrenched in the War to End All Wars, all thanks to Chris Pine’s doughy and charming American-soldier-turned-British-spy Steve Treveor. The villains are, of course, the Germans (Danny Huston as the war-hungry General Erich Ludendorff and Elena Anaya as Doctor Maru/Doctor Poison, his sidekick mad scientist, complete with a half-prosthetic face) but Wonder Woman is convinced that mankind is not plagued by its own greed and appetite for destruction, but instead, is under the influence of Ares, the God of War, whom she sets out to destroy — convinced that if Ares is dead, humans will all turn good again, evil Germans included. And this is where Jenkins displays her knowledge of the dichotomic lines that Wonder Woman has always straddled: that of a warrior princess but also a compassionate and peace-loving ambassador. And also, the line between the mythical and the real. While all her life Wonder Woman ached to join war and prepared to fight the good fight, when finally confronted with the price of war — innocent lives lost, poverty and destruction — she fights, but fights to help the unprotected, the ones who never asked for war. And finally we have a superhero romance arc that we actually deserve: From the moment Pine and Gadot set eyes on each other, its all pop, sizzle and boom! Pine also holds up on his own and serves some of the best lines of the movie. 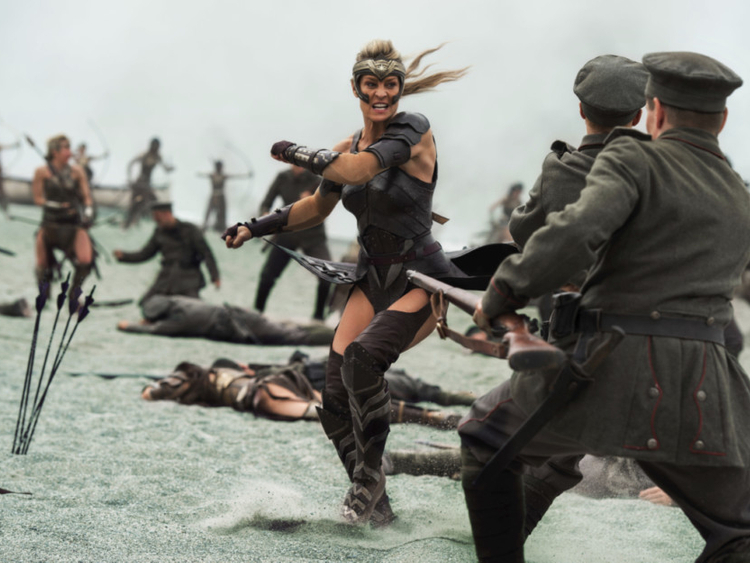 Predictably, and disappointingly, Wonder Woman loses steam in its final act: so busy is it in setting up a massive showdown with multiple leading characters that it eschews the movie’s central themes and its grand questions about war and morality. At a running time of 140 minutes, Wonder Woman could have done with some tighter editing. But the moral of the story, children, is that the world, of superheroes and mere mortals alike, is all the more better when there are more women around. Now let’s get that Black Widow movie going, shall we Marvel? Wonder Woman releases in the UAE on June 1.